General Motors said today it would hire 1,000 engineers and researchers in Michigan over the next two years to develop more electric cars and hybrids as it launched its battery-powered Chevrolet Volt. "Volt clearly demonstrates that we are well on our way and it is especially true when it comes to the electrification of the automobile," GM Chief Executive Dan Akerson said at a ceremony marking the start of production of the plug-in hybrid. The Volt, which tops the Toyota Prius for fuel economy, is a first-of-its-kind vehicle that GM has touted as a symbol of its commitment to pushing for gains in fuel efficiency and developing new technology. Akerson drove on stage in the first commercially made Volt at the ceremony to mark the start of the car's production, three years after the automaker announced the closely watched project. Akerson said GM wanted to be in the forefront of new vehicle technology--starting with the development of powerful battery packs and electric motors--that promises to reduce oil consumption. The Volt is designed to run for 35 miles on a full charge of its 400-pound lithium ion battery pack supplied by a unit of Korea's LG Chem. After that, the car is powered by a 1.4-liter engine that gives drivers an estimated 379 miles of driving range. Some critics had questioned whether the Volt would survive GM's restructuring in bankruptcy in 2009 because of its high cost and the low profit margin on the first shipments of the $41,000 car. GM North American chief Mark Reuss compared the development of the Volt to a NASA "moon shot." He said the effort, including more than $700 million in new investment, had "created the new soul of GM." GM will begin shipping the Volt in limited numbers in December. The automaker plans to expand shipments of the Volt to more markets in 2011 and will also start to export the vehicle, Akerson said. The Volt, which has won honors as Motor Trend Car of the Year and Green Car of the Year, is the first in a number of electric or partly electric cars to arrive over the next two years. The growing segment also includes the all-electric Nissan Leaf and upcoming rechargeable cars from Toyota and Ford. GM introduced a concept version of the Volt at the Detroit auto show in 2007 and started production this month at a plant that straddles Detroit and the city of Hamtramck, Mich. 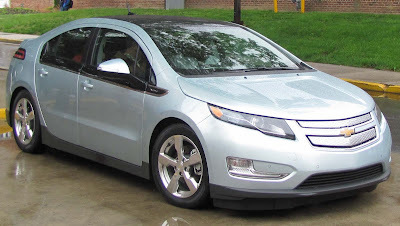 The automaker started development work on the vehicle that would become the Volt in 2006 at the urging of then product development chief Bob Lutz. The event to mark the start of Volt production is the first major event for GM since its record-setting $23 billion initial public offering of shares earlier this month.